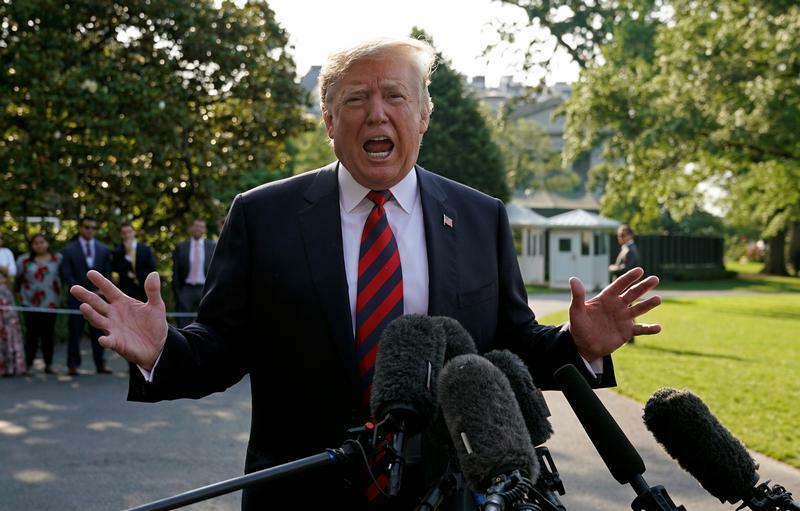 President Trump's unexpected Friday morning media blitz allowed him to share his opinions on a host of contentious issues, from his performance at the Singapore summit with North Korea's Kim Jong Un to the Department of Justice inspector general's report that was released Thursday. But not all of his claims stand up to scrutiny, with the president sometimes making misleading or outright false statements about President Obama and his own campaign team. President Trump: "Manafort has nothing to do with campaign...Worked for me for a very short period of time -- worked for many other Republicans -- he worked for me for 49 days or something." The facts: Paul Manafort, a longtime Republican strategist and lobbyist, joined the Trump campaign in March 2016 and was put in charge of persuading GOP convention delegates to back Mr. Trump. This was seen as a crucial task at the time, because while Mr. Trump was on his way to winning the nomination through the primaries, many in the GOP at the time were discussing ways to block him at the convention and give the nod to someone else. "Paul is a great asset and an important addition as we consolidate the tremendous support we have received in the primaries," Mr. Trump said in a statement as Manafort came aboard. In May, Manafort was promoted to campaign chairman, setting up a power struggle with then-campaign manager Corey Lewandowski, who had limited political experience before joining the Trump campaign. Within a few weeks, Manafort had cemented control of the Trump campaign and Lewandowski was fired. Mr. Trump then avoided a floor fight at the convention and secured the GOP nomination for president. On August 19, however, Mr. Trump announced that he accepted Manafort's resignation. "I am very appreciative for his great work in helping to get us where we are today, and in particular his work guiding us through the delegate and convention process," Mr. Trump said at the time. "Paul is a true professional and I wish him the greatest success." Given Manafort's severe legal troubles stemming from his relationship with a pro-Russia party in Ukraine and his status as a target of special counsel Robert Mueller's probe, it makes sense that Mr. Trump is trying to distance himself from his old campaign chairman. But the fact remains that Manafort, far from having nothing to do with the campaign, was a central force within it at a crucial juncture. President Trump: "President Obama lost Crimea, just so you understand...President Obama lost Crimea. Because Putin didn't respect President Obama, Obama lost Crimea. President Obama, not Trump." The facts: Ukrainian President Viktor Yanukovych, an ally of Russian President Vladimir Putin, was removed from office amid widespread protests in February 2014. In response, Russia annexed the strategically important Crimean peninsula in the Black Sea, which is home to major Russian naval assets. Short of all-out war, there was little the Obama administration could have done to prevent Russia from overrunning Crimea. However, the U.S. did respond with strict sanctions in league with its European allies. Russia's invasion and absorption of Crimea was also widely condemned by the broader international community, which further isolated Moscow. On CBS News "Face the Nation" on Sunday, Obama national security adviser Susan Rice said that attempts to blame the Crimean crisis on the previous administration were absurd. "The fact of the matter is, Russia had invaded Georgia," Rice said. "It then invaded the Ukraine. We rallied the entire European Union and many other partners to impose tough sanctions on Russia for its annexation. We supported the Ukrainian government to build up its defensive military capacity. And, along with our G7 partners, we agreed that Russia should no longer be part of this community of the G8...The United States has long upheld international law. This was the most brazen violation of another country's sovereignty that has occurred in recent years." President Trump: "I think the report yesterday, maybe more importantly than anything, totally exonerates me. There was no collusion. There was no obstruction." The facts: The Justice Department inspector general report does not address the questions of obstruction or collusion on Mr. Trump or anyone associated with him. Rather, the report examines the investigation into Hillary Clinton's email server, offering a stern rebuke for the behavior of some Bureau officials, including then-director James Comey and agents Peter Strzok and Lisa Page. However, it also found that while some agents may have been biased against Mr. Trump, the decision not to prosecute Clinton was the correct one. The report suggests Strzok, who led both the Clinton and Russia investigations, may have acted improperly. During its investigation, the inspector general uncovered text messages Strzok exchanged with top FBI lawyer Lisa Page. In August 2016, Page texted Strzok asking: "[Trump] is not ever going to become president, right? Right?!" Strzok replied, "No. No he won't. We'll stop it." Inspector General Michael E. Horowitz concluded that in the thousands of texts, Strzok and Page were critical of both candidates and "brought discredit to themselves and sowed doubt about the FBI " in its handling of the Clinton and then the Russia investigations. But the inspector general did not find political considerations affected the outcome of either agent's work. So while the report is at times a damning indictment of the behavior of some FBI officials, it in no way "exonerates" Mr. Trump from any of the allegations Mueller is investigating. Were we at the brink of war with North Korea? President Trump: "I want to have a good relationship with North Korea, I want to have a good relationship with many other countries, and what I've done, if you remember - if you're fair - which most of you aren't, but if you're fair, but when I came in people thought we were probably going to war with North Korea." The facts: Since the end of the Cold War, North Korea's quest for nuclear weapons and the means to deliver them have repeatedly confounded American presidents. Various attempts have been made since the 1990s to prevent North Korea from acquiring nuclear weapons and ICBMs. However, they have all been unsuccessful. In a sense, this has put the U.S. and North Korea on a collision course for years. But the most recent war worries really stem from the summer of 2017, when North Korea was testing new rockets and nuclear weapons at an accelerated rate. In August 2017, Mr. Trump promised that North Korea "will be met with fire and fury like the world has never seen" should they continue threatening the U.S. North Korea's threats, however, did not stop, leading to fears that war could break out on the Korean peninsula. While it's possible to argue that the U.S. and North Korea were looking like they would soon be at loggerheads when Mr. Trump took office, that elides the fact that tensions quickly escalated once he took office.